Contrary to our generation's belief, the meme came before the Internet. If you look up the definition of the word, you'll find this "an idea, behavior or style that spreads from person to person within a culture." Dig a little deeper (or scroll down the Wikipedia page) and you'll learn that word meme can be traced back to the 70s when evolutionary biologist Richard Dawkins published a book called The Selfish Gene wherein he shortened the word "mimeme" which derives from the greek word "mimema" which means "something imitated". When you take that into account it's makes perfect sense. Depending on how long you've been using the Internet, you've more than likely seen hundreds of funny things that multiple people find amusing enough to copy and reproduce. 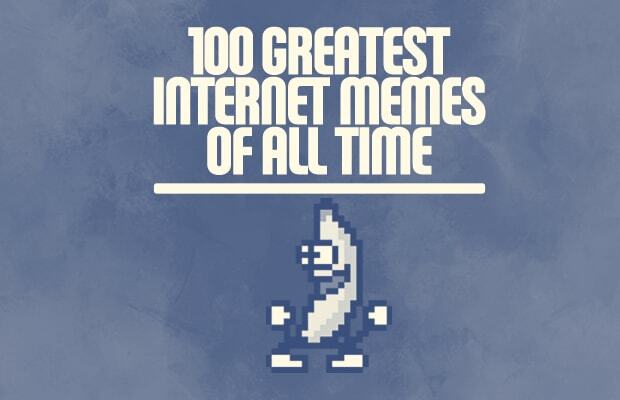 From “Dancing Baby” in the 90’s to “Tron Guy” in the early 2000’s to “The Honey Badger” in 2011, we’ve reviewed thousands of internet memes—ideas, images, catchphrases and videos that go viral and inspire imitation—to bring you our top 100 online sensations of all time. Read through, reminisce and try to keep a straight face.